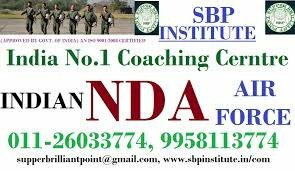 SBP INSTITUTE is the best coaching institute for NDA. Fresh batches for NDA – 2015 are going to start. SBP Coaching Institute is the well known coaching institute in Delhi-NCR that provides coaching for NDA entrance exams. At SBP Coaching Institute, we constantly strive to improve our teaching methodology, study material and classroom assignments. The Course Methodology is dynamic as it takes into account the changes that we notice in the pattern of the examination. SBP institute is a professionally managed and organized NDA coaching centre in Delhi, offering best coaching and preparing the job aspirants for the post of NDA Examination. We groom aspirants for the hard work that one needs to perform. We have been taught in our textbooks that soldiers are the country’s real heroes. It’s because they strive a lot day and night at our borders that we live peaceful lives. Though, we have acknowledged new lifestyles, where we aspire to settle in our lives with well paid jobs, there are many who want to give themselves for the service of the nation by joining any one of the three services (Army, Navy and the Air Force) as a career option. Learn to manage time effectively. When you are taking the exam, divide your time in such a manner that you are able to attempt all the questions. Have a clear plan in mind before you walk into the examination hall. In the hall, you just need to execute the plan. It may seem difficult to answer all questions in given time, but with a little bit of smartness and practice, you can give it a shot. We know you are unique and your study needs are different from another student. Fresh batch will be starting on 25th MAY. Seats are limited. •A unique learning methodology with a focus on speed and accuracy. •A weekly test is conducted on every sixth day of the week. •During the remediation/doubt clearing session, the teacher discusses common problems and tricky questions of the practice session/test. Hence, if you want to appear in this test with full confidence and with massive preparation, then select SBP INSTITUTE and we will coach you with diligence and in depth proficiency. ADDRESS: TA -93 Tughlakabad Extn. Near P.N.B. Bank & Allahabad Bank New Delhi – 110019. ADDRESS: A-14 Swsthya Vihar Main Vikas Marg, Near Preet Vihar Metro PILLAR NO. 81, 82 New Delhi –110092.